I made/altered back in September. I haven’t been very productive lately, and haven’t made anything yet this October. I think it s nearly a month since I sat down at my sewing machine. I’m blaming work and being too tired! Although I’m also quite content with my wardrobe full of self made tops and dresses. Plus its getting tricky to fit anything else in. And thats after having a good clear out. Anyway back to what I did manage to do in September. I made another trapeze top, but this time I added 6cm to my original top pattern. And I think its a pretty good length. This is my 3rd garment in this fabric. It was fairly straight forward to do, and I’ve worn it so many more times as a top than I did when it was a dress. I still have the longer one I made, and I’ll be keeping that one as a dress. I know the tops look the same but trust me they are two different tops. 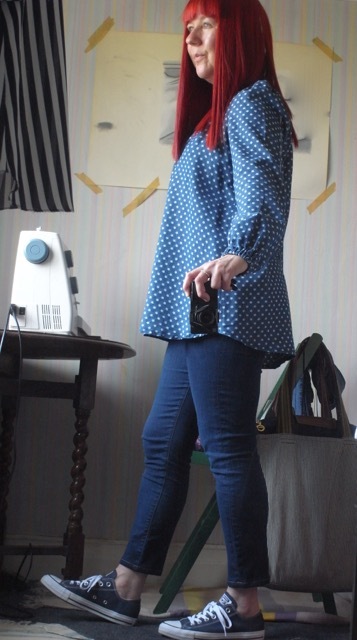 Then I shortened some jeans, it always makes me happy when I do an alteration! I think shortened I them by about 3inches but it might be a bit more. They’re not the jeans worn in the above picture, but these were a similar length, but I didn’t like them longer as they weren’t as tight as the others and I didn’t think they looked quite as good. Now I’m happy with them. I also shortened sleeves on about six shirts for my Dad. Nothing fancy. I don’t have pics of those.